Discussion in 'DPF Game Room' started by Sami, Jan 14, 2018. 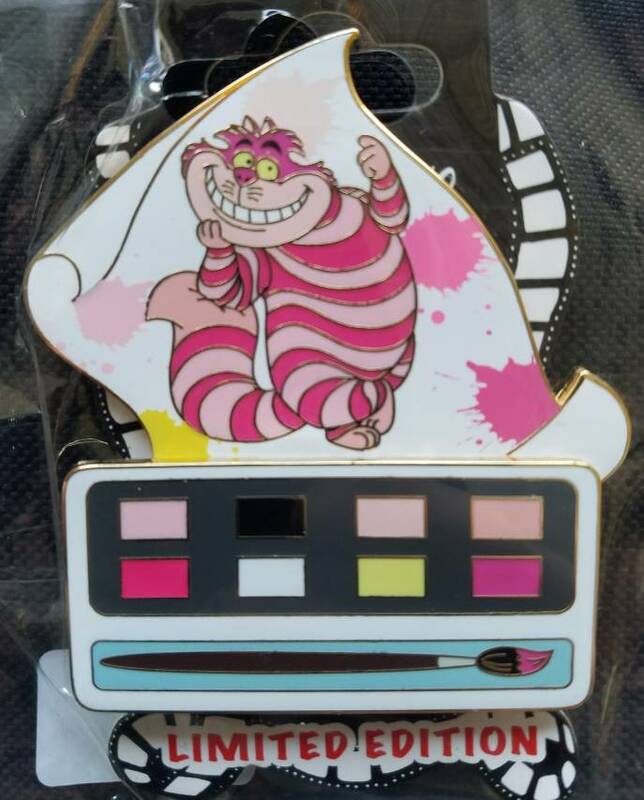 I was able to Snag an extra Cheshire Cat from the DSSH Paint Release(sorry no PinPics # yet) I thought it would be fun to do a Cheshire Cat Give Away! So the only 2 things you have to do is... show me your favorite Cheshire!! This can be in Gif, Pin, Picture, Art, Video Game, Fan/Personal Art, etc. Also, tell me a little about why this is your favorite Cheshie! I love Cheshire Cat, he has always been one of my favorite Disney characters. Even though I love the Disney Cheshire my favorite is actually the Cheshire from American Mcgee's Alice Video Game. He is on the creepier side of the many faces of Cheshire, but he is a mighty cool cat. I love when he pops up in the game, I can't get enough of the detail in this version either, he is absolutely one of my Fav. 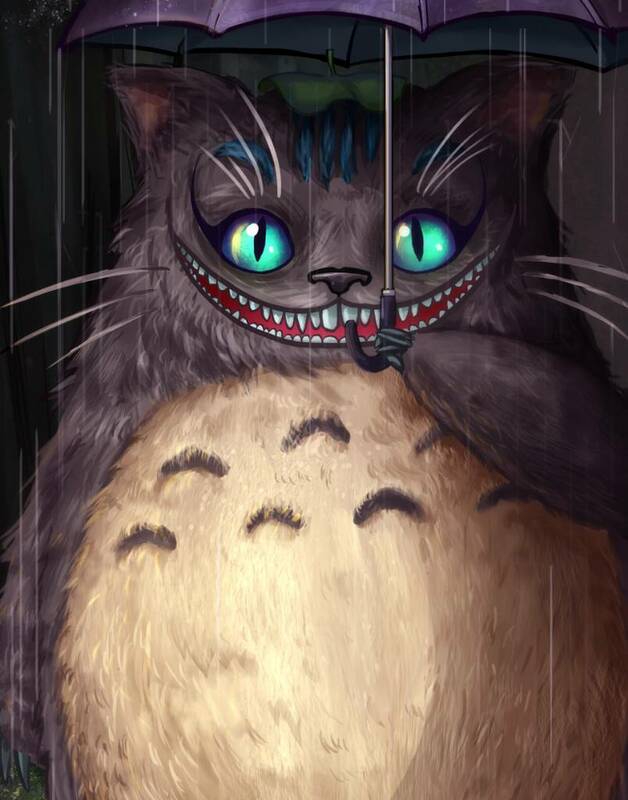 I also found this MashUp that I really liked of Totoro and Cheshire... Cheshotoro!! 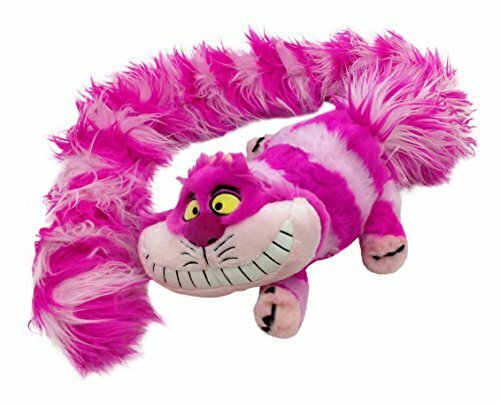 I will pick the winner based on images and Description of their favorite Cheshire Cat! Winner can be found on Post #2. Good luck to all the Cheshire Lovers of DPF! PixiePost, coblj003, Spr175psu and 5 others like this. Thank you for sharing your childhood memories of Cheshire! Spr175psu, CCofRR13, watzshakinbacon and 2 others like this. Disneychildwithin, CCofRR13 and Sami like this. HUGE Cheshire Cat fan here! Is it a coincidence that my initals are CC and so are his????? Interestingly, I only collect the traditional pink Cheshire pins but I LOVE the blue, Tim Burton Cheshire. It is my hope to get the blue one tattooed on my back (covering up an old tattoo that I do not like anymore and should not have gotten - long story). I already have a small Disney pink Chesie tattooed on my leg (my first tattoo). I've always loved him because he is mischievous but so darn cute. I'm also an animal person - especially cats. I love his quote: "I am not crazy, my reality is just different from yours." Lol, yes he is a very Punny kitty! HUGE Cheshire Cat fan here! Is it a coincidence that my initals are CC and so are his????? Interestingly, I only collect the traditional pink Cheshire pins but I LOVE the blue, Tim Burton Cheshire. It is my hope to get the blue one tattooed on my back (covering up an old tattoo that I do not like anymore and should not have gotten - long story). I already have a small Disney pink Chesie tattooed on my leg (my first tattoo). I've always loved him because he is mischievous but so darn cute. I'm also am animal person - especially cats. Haha! Yes I love that quote too! I really enjoyed Tim Burton's take on Cheshire, wow and a tattoo, Super Cheshire Fan here! 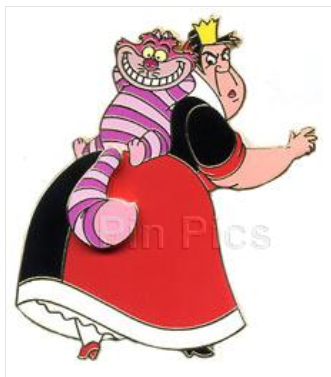 I always liked the Disney Cheshire, I loved him as a kid because he was not only a cat, but he was also PINK! I got a plush Cheshire on my first trip to Disneyland when I was 5. I always liked the part when he asks "Can you stand on your head?" TheMickeyMouseRules, Sami and CCofRR13 like this. Aww, what a wonderful Cheshie memory!! To me, this borrowed pin pic from pinpics says it all about CC. He's just relaxed with a big grin and no care in the world even though he is annoying the most dangerous character in Wonderland. Everyone else is frightened and literally shake in fear from the Queen but he uses her as his play toy (and lounge chair). Nothing worries this guy because nothing can touch this guy. Connies_Hobby, Disneychildwithin and Sami like this. watzshakinbacon and Sami like this. I LOVE all pins Alice and Wonderland -- these are the one I look for most when I'm at the parks! 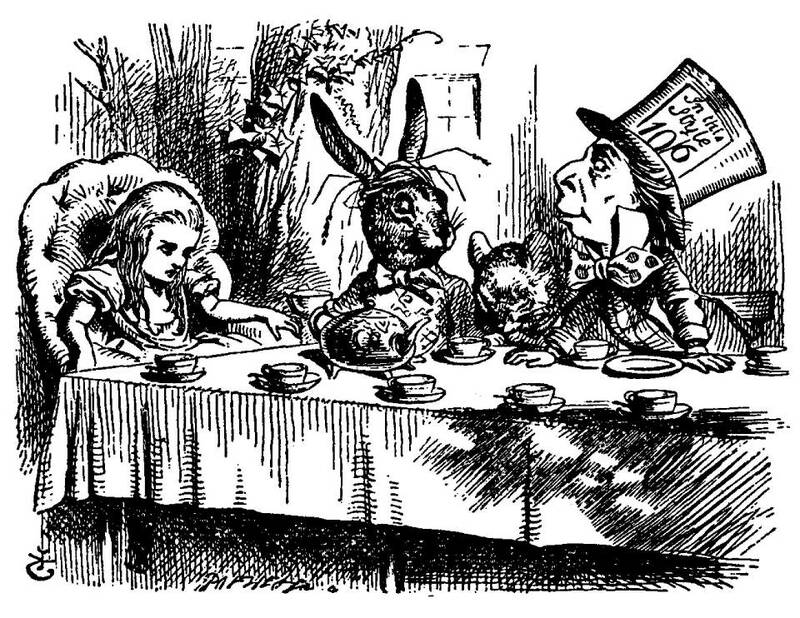 Reading the original story by Lewis Carroll is such a joy, and a complete charge to your imagination, from the walrus and the carpenter to the befuddling, charming character we're talking about on this thread. I especially love how he talks in riddles. I definitely prefer the kitty from the classic Disney film. Here he is! Sorry to hear you were going through a difficult time, glad Cheshire was there to help you through some of it! Love the boas! One Disney trip, we decided to collect all of them. The Cheshire Cat and Meeko are our favorites! It is a lesson that I try to strengthen in my daughter every day, that we are all different and all perceive things differently. When I drive her to school, I always try to take a different path every day for two reasons: 1) the longer path allows me to spend more time with her, and 2) to teach her that there are many ways to solve a problem, to get from point A to point B. Coincidentally, Alice Through the Looking Glass was the first "live action" movie I took my daughter to. She was 3 at the time and slept through the entire thing. Using Cheshire as a learning tool is a great idea! Perception is a great thing to teach, just like the cones of the iris, each person sees color differently than the next; peoples perception of the same thing can be uniquely different from another's. Lmao, I love that ending 'and slept through the entire thing', and now she has a big crush on Eric. She also thinks I look like Gaston or Hercules...perception is absolutely uniquely different from one person to the next! She and her mom both have a crush on Eric. So every time we're at Disney World, we just have to do the Bon Voyage character breakfast at Trattoria al Forno. Bump! A few more days to sign up! 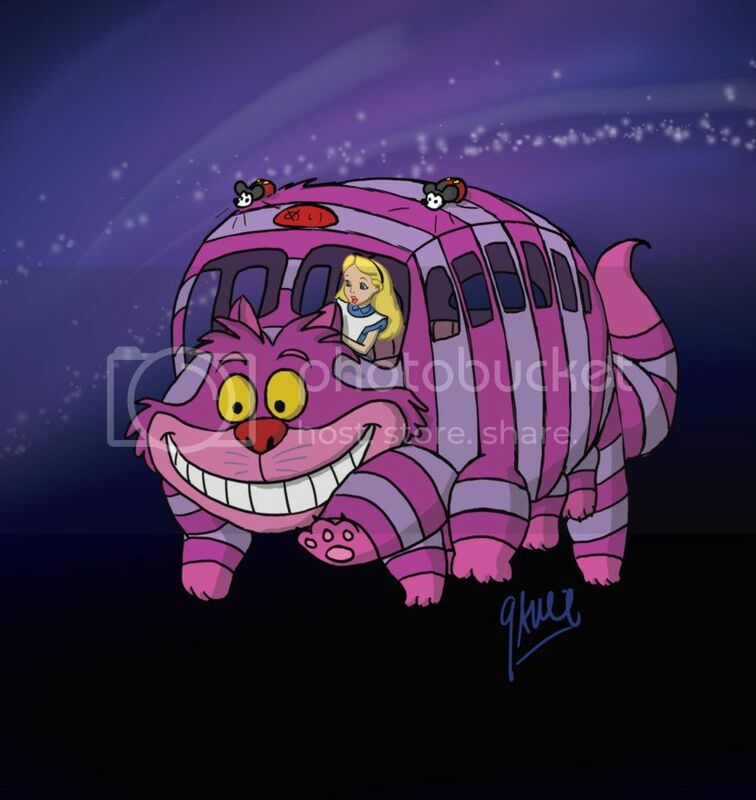 I always thought that the catbus from totoro was very similar to the cheshire cat. This kinda toys with that idea a bit. CCofRR13 and Ajk like this. Last day if anyone still wants to sign up! I'm going to go classic. The only reason I am picking this picture is because it's my favorite. It was the one that first drew me to Alice in Wonderland, it is the Cheshire Cat it his purest form. Wonderland is where I want to be, with the Cheshire Cat to guide me. I also love every form of him, new old, and twisted. Actually I love all of Alice in wonderland's versions. I'm actually hopping to get a copy of one of the TV movies, the where where Whoopi Goldberg is the Cheshire Cat. Another lover of the books, the illustrations by John Tenniel really brought the story to life, I don't think it would be quite the same without them. 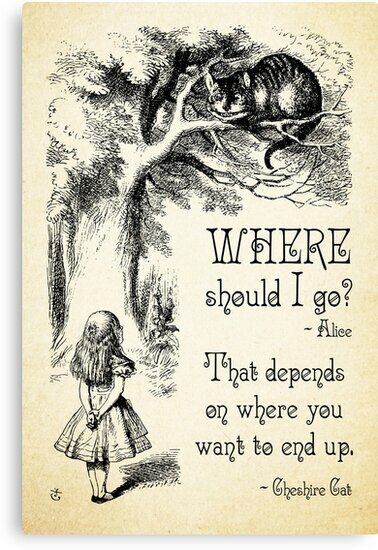 That would be quite an adventure, with Cheshire in Wonderland, no boundaries other than the imagination!